A couple miles west of the Big Bear village, up in the hills off of USFS road 2N10, nestled in the woods, is a small manmade lake. This lake is the home of the Cedar Lake Christian Camp that provides lodging and camping accommodations to private groups. It is also a popular location for the film industry. Cedar Lake is a manmade lake. The dam that created it was constructed the Bartlett family in 1928, as part of an ambitious resort and real estate development that had nothing to do with Hollywood. In 1929, a year after the dam was built, the stock market crashed. The great depression hit, and construction on the new Bartlett resort came to a halt. Henry Fonda on the set of “Trail Of The Lonesome Pine” – Rick Keppler collection. Then in 1935, a Hollywood production company approached the Bartlett’s, and asked permission to build movie set on the east side of the dam for a movie they wanted to film. A deal was struck. 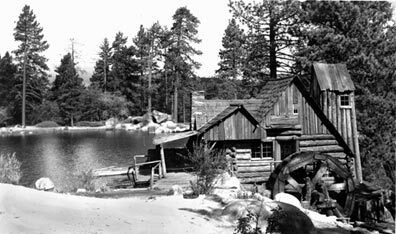 And in 1936, they built a rustic old mill, and started filming “Trail of the Lonesome Pine” starring Henry Fonda and Fred Mac Murray. From that point on Cedar Lake gradually evolved into an important “back lot” for the movie industry. Over the years over a hundred films have been made at the little lake. Even today it used regularly for films, TV shows, and commercials. But, the grand resort that the Bartlett’s had once envisioned, never happened. 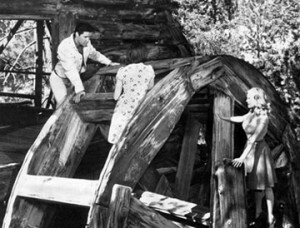 Elvis in Big Bear on the old Cedar Lake mill, singing to his leading ladies on the set of his movie “Kissing Cousins”. – Rick Keppler collection. Elvis Presley was in Big Bear in the 1960’s. 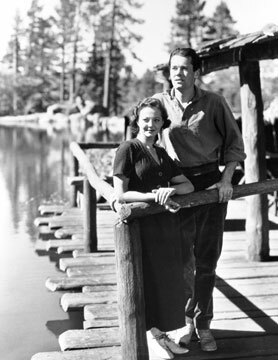 Here he is singing to his leading ladies on the old sawmill during the filming of his movie “Kissing Cousins”. While he was up here, Elvis made a memorable visit with Mel Blanc at his lake front home, and spent some time boating on the lake with Mel and Roy Rogers.